The more difficult-to-find materials have arrived. 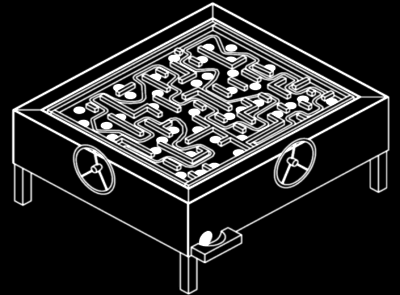 The maze itself will be constructed from a frame of wooden 2x4s supporting a 3/4″ plywood surface. Graphics will be spray painted (instead of applied by brush) to keep the surface flat. I’ve been living in AutoCAD recently, designing the frame. I have a pretty good idea of how the tilt of the table will be controlled. I knew that the millwork for Shoot the Moon was going to waste more than a sheet of plywood, and so I had Southern Lumber make half of Labyrinth’s plywood pieces from the scraps. Since I still need to make Labyrinth’s final cutting diagram, I hope that I chose the right sizes for the pieces! I made good progress on the Labyrinth Design (PDF). I constructed the base and the maze frame of Labyrinth! 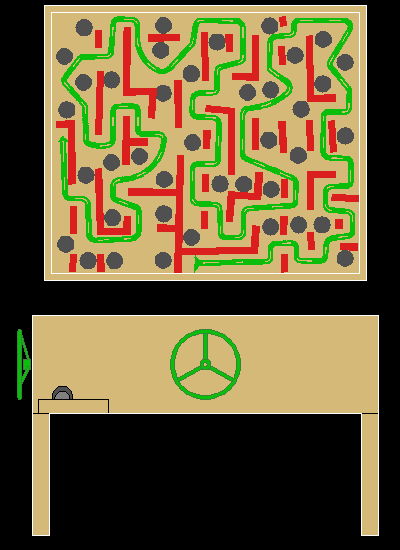 So essentially, I have labyrinth, but it has no barriers or holes yet (making it easy to play–ha! ), and it isn’t yet controlled by the steering wheels. Actually, these two pieces aren’t yet attached together, but their major construction is done. I also laser-cut the mask that lets me paint the path on the maze. Laser-cutting the masks was—uh—exciting. About one-third of the way through the laser-cutting process, I felt a cooling mist hitting my face. Since it was a sunny day, and I was indoors watching the 240-volt powered laser cutter as it worked, there shouldn’t have been any water around. Except for the laser tube’s coolant. Distilled water gets pumped through the laser tube, to an aquarium chiller, and back into the reservoir to be pumped back up to the tube. It’s supposed to be a closed system. The water of this “closed system” was spraying from the output coupler of the laser tube, and so I switched off the tube’s supply and powered down everything else. The output coupler is grounded, and so there was no chance of electrocution from the leak, but the output coupler gets cooled first because it’s the most critical part of the tube. I didn’t see any cracks in the tube, but I did see that the latex coolant tube was cracked from heat and age. I cut off the bad end, reattached the newly cut end to the laser tube, dried everything, and restarted the cut. No more spraying water mist. It seems that the mask came out okay.